Saturday night we hosted a Welcome Home Pete/Trail Family Holiday party at our house. I love people, I love parties. But party planning quickly devolves into a panicking party as I am faced with the harsh reality that I have zero hosting skills. I would love for my hosting level to be Martha Stewart and Snoop Dogg, but it's barely even Frat Party Without The Keg. Basically, it's just red Solo cups and a plastic tub of Cheetos. Our 1200 square foot house is too small for a party of 30-40 people. I am averse to holiday decorations. (While I can appreciate them aesthetically and think they look lovely in other people's homes, the thought of buying and displaying decorations in my own home induces stress not joy). As for my cooking skills, the most charitable thing you could say about them is that I have yet to burn anything down. So I tend to be anxious whenever people are coming over to our house. I want to have people over. I want them to feel welcome and be well fed and have a good time. But I have strong doubts about my ability to deliver on those promises. Then I had a moment of sanity where my brain decided: You can just be who you are. And I finally relaxed. People are well aware than I am not Martha Stewart or Snoop Dogg. No one comes to my house expecting a gourmet meal or a Pottery Barn catalog or Gin & Juice. People come to my house bearing cookies and dressed in a banana costume. I am never going to throw a Pinterest-worthy party. That is not my thing. And that's ok. I am going to throw the kinds of parties where everyone is welcome, where love, laughter and chin-ups are plentiful, where somehow we always end the night dancing in the living room (and by somehow I mean because of Pete). Because those are my things. 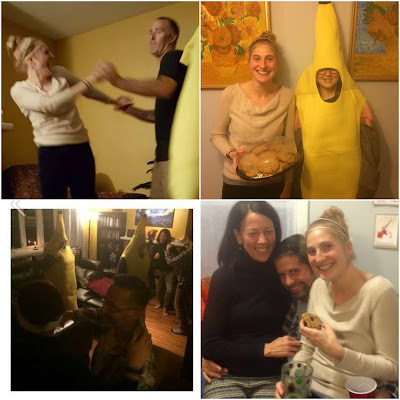 Holidays are for dancing, bananas, cookies and Tramily. At the party, I looked around and marveled at all the people who had come to see my funny, strong, remarkable husband, all the people who had filled up my 2016 with so much happiness and love. Steven pretended he was leaving every 5 minutes and went around giving everyone goodbye hugs. And I realized that was the perfect metaphor for how I want to live my life. My time here is short. I don't know when exactly I'm leaving the party of life (hopefully not for many decades). But I could be tossed out of this aliveness rave at any time. As long as I'm still here, I want to embrace it. Might as well do it literally. And Jenuinely. And so my very best good friends, if you ever feel overwhelmed by expectations or pressures to be a certain way or do a certain thing, remember that you can just be who you are. You can say no to that thing you don't want to do. You can opt out of the traditions that don't bring you joy. You can make the holidays whatever you want them to be. Party on. Lyric of the moment: "The moon is right. The spirits up. We're here tonight. And that's enough. Simply having a wonderful Christmastime. The party's on. The feeling's here. That only comes this time of year. Simply having a wonderful Christmastime..." ~Paul McCartney "Wonderful Christmastime"